Piece Out is a Duel minigame found in Mario Party 5 and a Puzzle minigame in Mario Party DS. The title is based of the saying "peace out". This game features 1-minute, 3-minute and 5-minute modes; in all modes other than Free Play, the duel is contested under the standard 1-minute mode. The object of the game is for players to fill their respective space with blocks carried out by a conveyor belt. There are several types of pieces, all of which come in four colors: Red, Yellow, Green, and Blue. The types of pieces are: single blocks (1 block), double blocks (2 blocks), triple blocks (3 blocks), quadruple blocks (4 blocks) in line form or rectangle form, and double triple blocks (6 blocks that consists of two rows of triple blocks). If the player picks the wrong block(s) and wants to get rid of them, they must hover the blocks over the Trash Bin area at the bottom of the player's field. This way, the player will get rid of this block and will be able to grab a new one. Once the field is completely filled, the pieces will disappear, giving the player more chances to fill the space and get more points. Points are based on the size of the area of the same-colored blocks, and are not awarded until the space is filled. Filling all the blocks in one color awards 13,500 points in the Mario Party 5 version, and 35,000 points in the Mario Party DS version. At the end of the time limit, whoever has the most points is declared the winner. 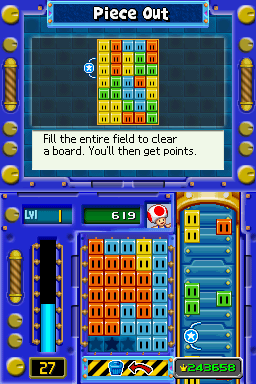 In the Mario Party DS Single Player version, the player has one minute in a level to fill their grid. The player must fill the grid completely to complete a level, and the minigame ends if time runs out in any level. 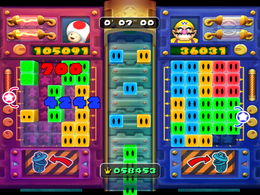 The multiplayer version follows the same rules as Mario Party 5, and allows time settings of 1:00, 3:00 and 5:00. Rules – "Completely fill in the space by taking pieces from the conveyor belt and placing them onto the field." Advice 1 – "Once the field is filled, the pieces disappear, and you'll have another chance to complete the field." Advice 2 – "Get more points by using more of the same colored blocks." Rules (1 player) – "Grab the pieces on the conveyor belt that help you fully fill your field. Put any that you don't want in the trash." Rules (2 players) – "Grab the pieces on the conveyor belt that help you fully fill your field. Put any that you don't want in the trash. The player with the most points wins." Tips (1 player) – "Line up pieces of the same color to score more points. Keep an eye on your remaining time. And think about how the pieces best fit together!" Tips (2 players) – "Line up pieces of the same color to score more points. And be sure to toss pieces you don't need in the trash instead of trying to use them!" Pīsu o Ubae! Rob the Piece! Ānpái nǐ de zuòpǐn! Arrange your work! This page was last edited on October 1, 2018, at 22:41.